Welcome to the first Haunted Guest House mystery-the getaway every reader can afford. Newly divorced Alison Kerby wants a second chance for herself and her nine-year-old daughter. She's returned to her hometown on the Jersey Shore to transform a Victorian fixer-upper into a charming-and profitable-guest house. One small problem: the house is haunted, and the two ghosts insist Alison must find out who killed them. 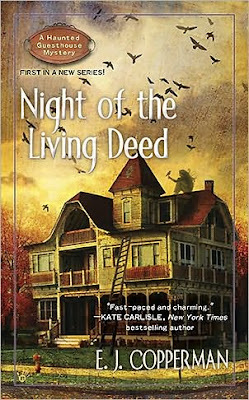 Night of the Living Deed is a fast-paced, enjoyable mystery with a wise-cracking, but no nonsense, sensible heroine. Alison is immediately likable, as is Paul (Maxie takes a while to grow on you), and daughter Melissa is precocious without being precious. The mystery is fast paced and there red herrings galore, many suspects and several possible motives to keep readers guessing until the end. NIGHT OF THE LIVING DEED will keep you flipping the pages faster and faster. A wonderful, detailed, first in a new series ghostly story that will keep you surprised, and smiling. You will read this book, and then pass it on again and again. E.J. Copperman writes in such a realistic way, you will feel as if you are another spirit, living within the walls of a guesthouse, watching an amazing story unfold. I'm looking forward to reading this one--think I'll take it to the beach with me! Bought my copy on Friday. I know it will be a good book. I saw the author's real name. This is my next to be read book. Yeah! Love the title! I read it twice straight through! I can't wait to start reading this one! Got my copy a while ago, but this dratted deadline is keeping me from getting started! Just picked this one up last week. I had added it to my to read list after seeing it mentioned on a couple of my favorite blogs. Looking forward to a new series. Loved it! Can't wait for the next one!! !